There is a severe degree of narrowing in this coronary artery. It is "complex" in that there is a large area of calcification on the lower right, which appears bluish on this H&E stain. 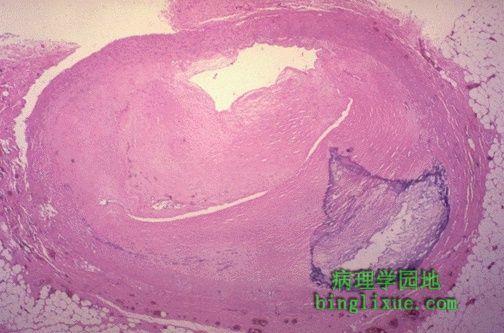 Complex atheroma have calcification, thrombosis, or hemorrhage. Such calcification would make coronary angioplasty difficult.